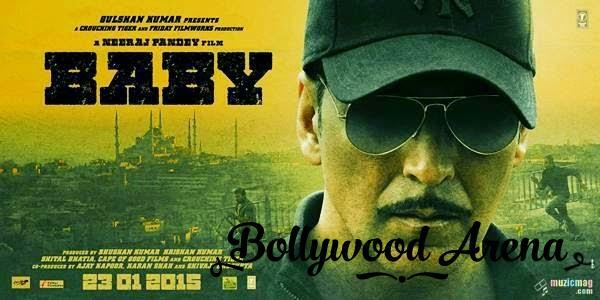 Baby is an espionage action thriller film directed by Neeraj Pandey.The trailer of the movie has been received well by people.The buzz and hype for the movie has been extremely high.It is the first movie of Akshay Kumar in 2015 so his fans are waiting desperately for his movie.Baby is one of the most awaited movies of 2015. Baby will release on 23rd January 2015.It will face competition from ‘Dolly Ki Doli’ starring Sonam Kapoor which will release on the same date.But it will have the advantage of Republic Day as it is a holiday in all across India.Here is the baby movie review. Now take a look at the Baby Movie Review. Baby will release on 23 January worldwide. Here is the short review of Akshay Kumar’s Baby.Full review will be published soon. Baby is the story of Ajay Singh Rajput (played by Akshay Kumar) who is an officer in a special unit of anti terrorist squad.In investigatig one terror attack he finds a major plan to attack different parts of India.Maulan Muhammad Ramzan (played by Rashid Niaz) is the terrorist residing in Kashmir seems to be behind this plan.The whole next movie is about Akshay Kumar and his team’s efforts to prevent the terrorist attack.The Baby movie is story of seven days.We will not reveal much as it will decrease your suspense. After directing two thrillers ‘A Wednesday and Special 26’,Neeraj Pandey has decided to put his hands on an action thriller and the result is an absolute masterpiece.The first half has a good pace and the second half is absolutely amazing.The director has managed to put your interest throughout the movie.The last twenty minutes are surely an edge to seat thriller.You will not blink once during the climax.Baby movie surely belongs to Neeraj Pandey. Screenplay is pitch perfect specially in the second half while background score needs special mention as it lifts many scene in Baby.Editing could be better. Akshay Kumar delivers the performance of his life time.He looks perfect as a special officer of anti terrorist squad.His performance is surely an award deserving. Anupam Kher was missing in the first half and makes his entry in the second one.He impresses again with his natural acting. Rana Daggubati makes a solid impact with his acting as well as with his muscles. Tapsee Panu also managed to deliver a decent act. Rasheed Naz from Pakistan was pitch perfect as a Moulana.He looks brilliant and natural.Kay Kay Menon looks out standing in a short presence. Baby is an excellent entertainer movie.It is surely the best movie ever made against terrorism.Baby will reveal many aspects that have never been discussed.Baby have many elements thrill,suspense and patriotism.I hope Indian PM Narendra Modi watches Baby. Baby is a must watch movie for every one.